Registration will close at the end of today March 4, 2019. 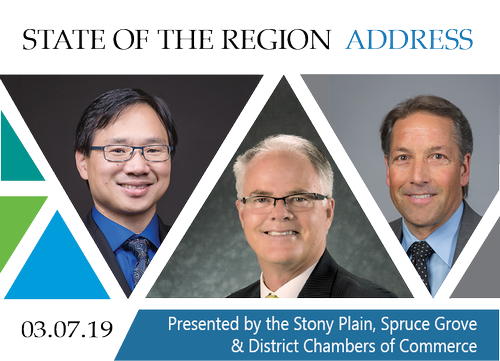 Stony Plain, Spruce Grove & District Chambers of Commerce welcome Mayor Rod Shaigec of Parkland County, Mayor Stuart Houston of the City of Spruce Grove, and Mayor William Choy of the Town of Stony Plain as our guest presenters for the Annual Mayors? Regional Address, Thursday, March 7th at the Stony Plain Heritage Pavilion in Stony Plain. All regions are excellently represented with leadership and have notably taken a leadership role with the Edmonton Global, Partners for Regional Prosperity, a group of 15 member municipalities. The vision is that the Edmonton Region is the the business of choice for global investment collaboratively built on regional assets. Our region continues to welcome new business to our many industrial and commercial parks which continue to grow despite economic challenges. The chambers are pleased to host this dinner event and offer our guests a phenomenal buffet dinner,. Our Mayors? are the highlight of the evening as they share with our guests the future focused developments and plans for the region. In the Spruce Grove Hall at Heritage Park in Stony Plain.